A luxury dark milk chocolate bar created by renowned bean to bar maker Bonnat. With a cocoa content of 65% this truly is a dark milk bar. The milk still gives the chocolate an extra sweetness as well as producing and overwhelmingly smooth and creamy mouth feel. 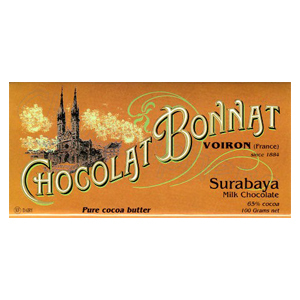 The cacao for this dark milk chocolate bar is hand chosen in the east Javan city of Surabaya. The intemperate climate on this large Indonesian island means that, as with Papua chocolate, the beans are dried using large open fires. The result is a chocolate infused with a little hint of smoke. ‘Smokey’ is a flavour you might more likely associate with barbecues than chocolate, but we find the almost savoury notes blend perfectly into this rich and buttery dark milk chocolate. I live in France for half the year and discovered chocolate Bonnat while there. I was delighted to find it in the UK. I like milk chocolate, which I realise is deeply uncool. Bonnat milk, unlike most others, does not have sugar as the main ingredient, and cocoa content is over 60%. My lifetime quest is to find the best milk chocolate, and I thought I had it in Valrhona, but this is better. Paradise on the palate, no bitterness and none of the cloying sweetness of most milk chocolate. Really delicious dark milk chocolate, with a lovely smooth and creamy feel in the mouth. Not too dark, even though it's 65% cocoa.